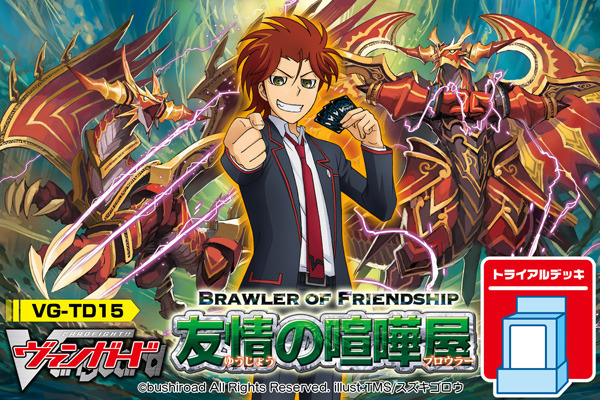 Experience the new System "Legion" that appears in the animated series "Cardfight!! 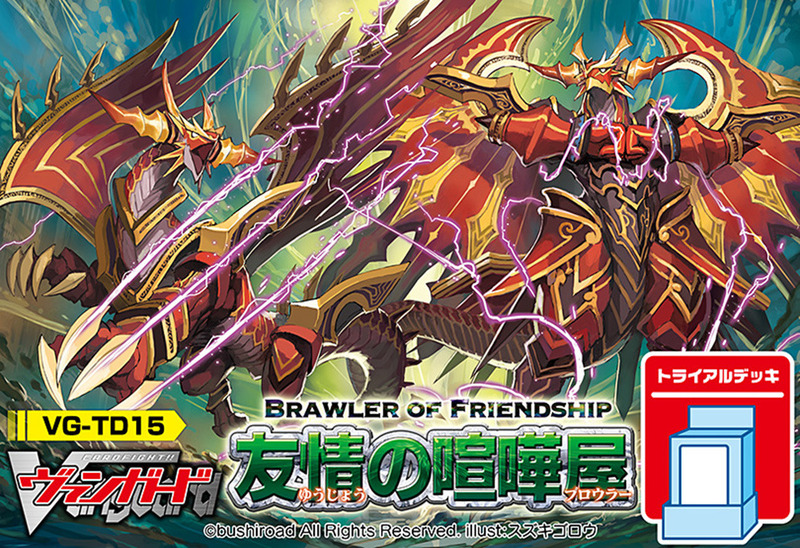 Vanguard Legion Mate Hen"
A Trial Deck has appeared based around the fan favorite "Royal Paladins". Because it's a Trial Deck for the start of "Legion Mate Hen", it's super easy for new fans to use! And you can use it to strengthen your existing "Royal Paladin" Deck! A "Narukami" Trial Deck appears filled with the clans ever popular and cool dragons. Because it's a Trial Deck for the start of "Legion Mate Hen", it's super easy for new fans to use! And you can use it to strengthen your existing "Narukami" Deck! 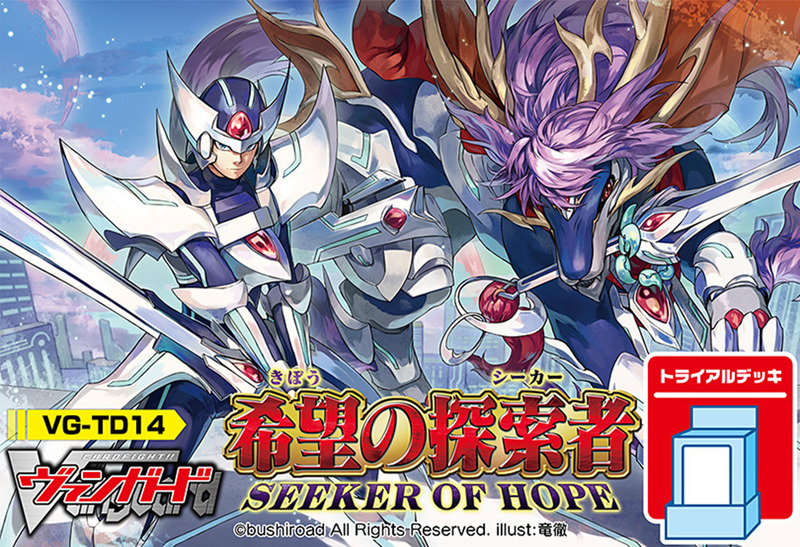 Trial Deck "Seeker of Hope"
Trial Deck "Brawler of Friendship"
The artwork for BBS looks really weird to me. Like, because of Wingals leg armour part, it looks like BBS has 2 arms holding his sword, and another like a fugging battering ram. Wingal boss card plz. Would love if it worked like Barking Manticore for Blaster Blade Seeker interaction, with like an LB in place of the power boost. 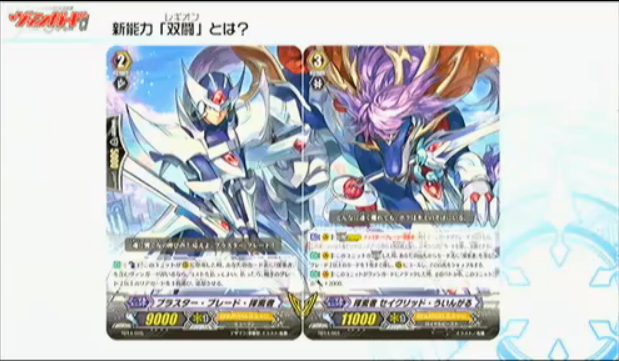 Thinking about this now, if BBS is just a Seeker print of BBL then Seeker decks will invariably run original flavor Blaster Blade and Blade Seeker together. I would like Seeker to have a vanguard-exclusive skill as well though. And then Kai was the protagonist. 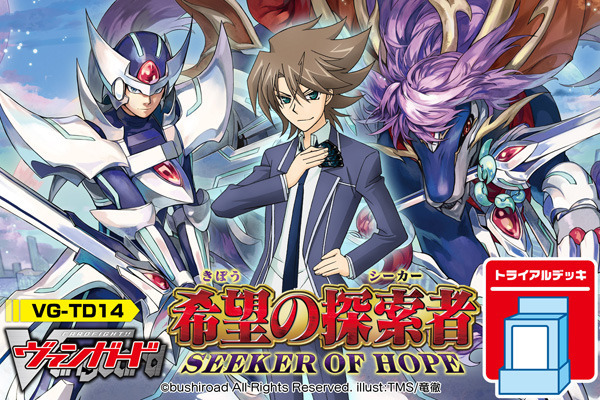 "Seeker of Hope" - Kai isn't gonna be an edgy as f*** MC anymore hurray. P.s. Was Ren unreversed when Aichi and Takuto stopped World End or? [AUTO](RC):[Put this unit into your soul] When your vanguard is [??? ]ed, you may pay the cost. If you do, search your deck for up to one card named "Blaster Blade Seeker", call it to (RC), and shuffle your deck. [ACT](RC):[Put this unit into your soul] Choose one of your vanguard, it gets "[AUTO](VC):[Counter Blast(1)] During your turn, when opponent's front row rearguard is sent to drop zone, if this unit is [??? ]ed, you may pay the cost. If you do, choose up to one rearguard with the same column as that unit, and retire it." until end of turn. ...That does look like a new symbol. Hooray for new mechanics. "Legion Mates" seem to determined by if their arts can combine with one another. "Legion" is also replacing Limit Break, and Lord is getting kicked out. Legion also combines base powers into one. Blaster Blader Seeker 「ブラスター・ブレード・探索者」 Grade 2/Intercept/Normal Unit/Royal Paladin/Human - Power 9000/Shield 5000/Critical: 1 Auto: [CounterBlast(1)] When this unit appears on the Rearguard Circle, if your Vanguard have "Seeker" in its name, you pay the cost. If you do, select 1 of your opponent's Grade 2 or above Rearguard, Retire it. Seeker, Sacred Wingal 「探索者 セイクリッド・ういんがる」 Grade 3/Twin Drive! !/Normal Unit/Royal Paladin/Hi-Beast - Power 11,000/Shield -/Critical: 1 Activate [V]: -Legion Mate 「ブラスターブレード探索者」- : Select 4 "Royal Paladin" Normal Units from your Drop Zone and Return it to your Deck. Afterwards, Shuffle your Deck and this unit is joined together with the Legion Mate. Auto [V]: When this unit becomes Legion, search your Deck for a Grade 2 or higher unit with "Seeker" in its name, and call it to the Rearguard Circle. Brawlers, Musketeers(BT16), and Raizers(BT16) are all confirmed for Legion Mates. April's monthly will have a legion duo as promos. Dat CB 1 for BBS tho.